BANGI, 5 August 2014 – The seeds of the 1941-1945 war in the Pacific could have been sown when Japan as one of the victors in World War One became dissatisfied of the treatment it received from its Western allies. 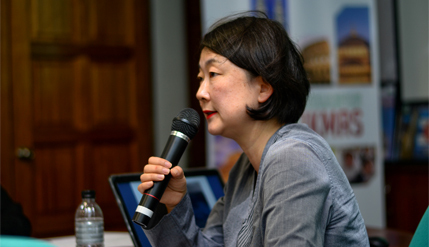 A professor from the Department of History, Classics and Archaeology, Birkbeck, University of London (UK), Dr Naoko Shimazu said Japan already modernising as a nation in the early 20th century saw itself as a major military power and an equal to the Anglo-Saxon nations. Giving a talk here recently on ‘What Sort of War was the First World War for Japan’ she said Japan expected to be treated the same as the other victorious European countries and demanded its share of captured territory from World War One. It was organised by The National University of Malaysia (UKM) Centre of Occidental Studies (IKON) of the Institute of Malaysian and International Studies (IKMAS) under its European studies programme which is currently being developed. Her talk was one of the events accompanying the centennial commemorative conference ‘Re-visiting World War I’ organised by IKON. Prof Shimazu said soon after the end of the 1914-1918 war, the United States, Britain and France – Japan’s allies and three most powerful countries in the League of Nations – however, forced Tokyo to give up the territories it captured from Germany, such as Quingdao in China. “Unlike many Western powers, Japan was a well-practised combatant state by 1914, having won two international wars in 1894-95 and 1904-5. Hence, we see threads of continuity in Japanese wartime activities connecting the 1914-18 experiences to the Russo-Japanese War of 1904-5, for example, in Japan’s ‘diplomacy of humanitarianism’ over its treatment of German prisoners of war from the siege of Qingdao,” she said. She spoke about the part played by Japan, the only true Asian great power of that time, in World War One and its impact on Japanese society. Prof Shimazu provided an Asian reference point regarding the conflict which is known mainly as the European war. Prof Shimazu said Japan’s former allies also put through resolutions in the League of Nations, the forerunner of the United Nations, which limited Japanese territorial expansion and curtailed the enlargement of the imperial navy and army in 1921. Disgusted at what it perceived as double standards and racism, Japan quit the League of Nations and embarked on a policy of territorial acquisition in China which it said was no different than European colonisation of Asia and Africa. “Racial politics played a part. Japan was seething because of what it saw as strident anti-Japanese sentiments in Britain and America. The Japanese felt that they were discriminated against at the Paris peace talks,” Prof Shimazu said. Tokyo also further developed its navy and had grand designs on east Asia, pointing out that Britain and France already had colonies there. East Asia was the only region where the West could not take Japan for granted. Japan did not think it was doing anything different than what Britain or France had been practising for much longer and thought it had the right to create spheres of influence as well. Present was IKMAS Deputy-Director Prof Dr Tham Siew Yean and Senior Fellows Assoc Prof Dr Zarina Othman, Dr Sumit K Mandal and Fellow Dr Helen Ting Mu Hung.